We’d love your help. Let us know what’s wrong with this preview of The Sacred Era by Yoshio Aramaki. 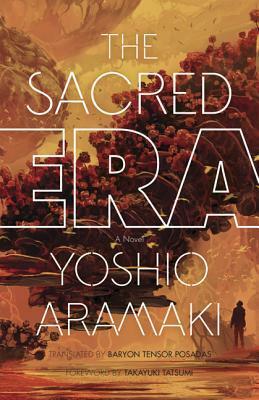 The magnum opus of a Japanese master of speculative fiction, and a book that established Yoshio Aramaki as a leading representative of the genre, The Sacred Era is part post-apocalyptic world, part faux-religious tract, and part dream narrative. In a distant future ruled by a new Papal Court serving the Holy Empire of Igitur, a young student known only as K arrives at the The magnum opus of a Japanese master of speculative fiction, and a book that established Yoshio Aramaki as a leading representative of the genre, The Sacred Era is part post-apocalyptic world, part faux-religious tract, and part dream narrative. In a distant future ruled by a new Papal Court serving the Holy Empire of Igitur, a young student known only as K arrives at the capital to take The Sacred Examination, a text that will qualify him for metaphysical research service with the court. His performance earns him an assignment in the secret Planet Bosch Research Department; this in turn puts him on the trail of a heretic executed many years earlier, whose headless ghost is still said to haunt the Papal Court, which carries him on an interplanetary pilgrimage across the Space Taklamakan Desert to the Planet Loulan, where time stands still, and finally to the mysterious, supposedly mythical Planet Bosch, a giant, floating plant-world that once orbited Earth but has somehow wandered 1,000 light years away. To ask other readers questions about The Sacred Era, please sign up. Why can't I give this book 25 stars?!?? Some cool philosophic ideas and some interesting ideas but not much of a story arc and really horrific gender politics. All women in this book are just props for sexual anxiety. More of a 2.5 star than a 3 but I'll be generous! I would call this a self-centric sci-fi story. Despite not being referred to by name throughout the book, the story revolves around its protagonist. Other characters are more like figments of his imagination and not real people. Its saving grace is that this lack of characterization is relevant to the plot. While it had its profound moments from time to time, I'm not familiar with Catholicism enough to catch all the themes and references. However, it did have some neat insights from time to time. I would call this a self-centric sci-fi story. Despite not being referred to by name throughout the book, the story revolves around its protagonist. Other characters are more like figments of his imagination and not real people. Its saving grace is that this lack of characterization is relevant to the plot. While it had its profound moments from time to time, I'm not familiar with Catholicism enough to catch all the themes and references. However, it did have some neat insights from time to time. This book is weird/bonkers/bananas etc. In the same vein as Kawamata Chiaki's Death Sentences (it's from the same publisher, U of Minnesota press), it follows a relatively straightforward story that quickly moves into the weird and metaphysical. It ends kind of abruptly and the plot basically takes a detour for larger philosophical and theological queries, which made the reading experience weird. This is not a book you read for the narrative, because the narrative is just a larger vehicle for spe This book is weird/bonkers/bananas etc. In the same vein as Kawamata Chiaki's Death Sentences (it's from the same publisher, U of Minnesota press), it follows a relatively straightforward story that quickly moves into the weird and metaphysical. It ends kind of abruptly and the plot basically takes a detour for larger philosophical and theological queries, which made the reading experience weird. This is not a book you read for the narrative, because the narrative is just a larger vehicle for speculations on the nature of existence, the nature of organized religion, and bending of space and time. This is sci-fi on acid. Another note: The prose is odd and kind of stilted but its prose-in-translation. Nuances in Japanese don't translate well over to English, and vice versa. This knocked it down a bit for me but it's sensible most of the time. I guess new wave isn't my thing. The weirdly filtered western theology is somewhat interesting but the offhanded misogyny is repellent. Women are beautiful, graceful, lustful, but never anything that isn't determined by being female. Even when they are mechanical. Really profound at times. The whole book has a really neat dreamlike quality unlike anything else I've read, other than Leaves of Narcissus. If you find theology or philosophy interesting, you will enjoy this. Personally I loved it. I must say that what other reviewers have said about female characters is true. However, i found the bulk of the material so interesting and, again, at times profound, that I can't give it less than 5 stars.